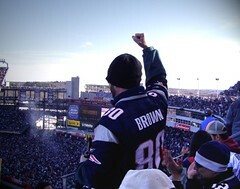 At the wild-card playoff between the New England Patriots and the New York Jets. This fan is celebrating another Patriots first down. The Patriots were victorious, 37-16.